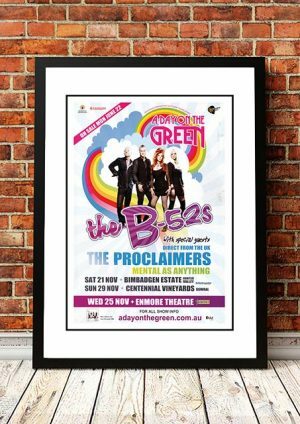 Classic Proclaimers Band Concert Posters and Memorabilia! Buy Online Now! When the Scottish duo of Craig and Charlie Reid emerged in 1987, they were immediately compared to the Everly Brothers. Considering their energetic, melodic folk-rock, the comparison made some sense, even though the Proclaimersdidn’t really sound like the Everlys. Instead, the two were a post-punk pop band, aggressively displaying their thick accents on sweet, infectiously melodic songs about love, politics, and life in Scotland. After two albums in the late ’80s (This Is the Story  and Sunshine on Leith ), the band disappeared for several years, suffering from personal problems and severe writer’s block. When their 1988 song “I’m Gonna Be (500 Miles)” was used in the 1993 film Benny & Joon, the Proclaimers began to receive massive radio airplay in America, sending them into the Top Ten in the U.S., as well as the rest of the world; it was their first taste of real success. Luckily, they were close to completing their third album at the time, Hit the Highway, leaving them in a position to capitalize on their success. The single “Let’s Get Married” received little attention, and the band pretty much disappeared. They made various contributions to several movie soundtracks — Dumb & Dumber and Bottle Rocket — during the latter part of the decade, but family matters took priority. The new millennium led to a much fresher-sounding Proclaimers. We stock some awesome Proclaimers Band Concert Posters.